Profile of a Female Motorcyclist: Meet Tyler | Helmet or Heels: I'm comfortable in either! I “met” Tyler when she stopped by the blog and left a comment. I am so glad she took me up on the invitation to share her story here. Tyler is from Santa Clara, CA and has an incredible come-back story that changed her life forever. I cannot begin to express my appreciation to her for sharing some of the lessons she’s learned. Tyler, you rock! How long have you been riding a motorcycle? Four years as pillion, 12 years as pilot. In June 2009, on a long distance trip to Wyoming, I was involved in a near fatal motorcycle accident. In Carey, Idaho, I made one of those split second decisions that didn’t seem like a big deal at the time but it was and it changed my life forever. I thought the driver of the semi had seen me as I pulled up alongside of him. He didn’t see me and started his left hand turn, knocking me and the bike to the ground and ran over me. Yup, I got run over by a semi. I was wearing full gear but when you’re run over by 150,000 pounds of load, I don’t think it would have mattered if my gear was made of titanium! I had a crushed pelvis, internal injuries, and severe degloving injuries on my legs but no spinal or head trauma or broken limbs. They didn’t think I’d make it through the night, but I did. They weren’t sure they would be able to save my legs, but they did. No one thought I’d be able to walk again, but by the grace of God and a whole lot of earth angels, I am. I was in the hospital for four months, endured many grafting surgeries, a month in rehab, and then back home after about six months. I never thought I would ride again. Fast forward a few months later and I’m missing riding … being with my friends, experiencing the world, meeting new people, finding new places … but I didn’t feel like I could take the risk of two-wheels again given the extent of the damage to my legs. I didn’t use up one of my nine lives with my experience … I used up about 8-1/2! So I did some research and settled on a 2009 CanAm Spyder (3-wheels). It’s very different from riding two-wheels but affords more stability and I still have the wind in my face, the throttle in my hand, and 1000 cc’s between my legs! Tyler on a photo shoot in Boise, ID for St. Alphonsus Hospital – she was featured in a Healing Story commercial! How did you learn to ride? I got into motorcycling through a gent I was dating. When he planned to move out of state, I signed up for the MSF course on the guise of understanding the workings of the bike so I could be a better passenger. But I ended up loving piloting my own and it seemed easier to get my own bike than find a new boyfriend to ride with! Why did you want to ride a motorcycle? The first time I got on the back of a bike, I was 22 and dating a guy with a bike. We hopped on (no gear laws at that time so jeans and tennis shoes only *shudder* to head for the beach. Unfortunately, we low-sided on some gravel but fortunately sustained minor injuries … the moto gods were looking out for us. After that, I was never comfortable on a bike so chose not to ride at all. Fast forward 20 years later … I don’t know what changed but all of a sudden I got “IT”… the “IT” that is so difficult to describe to folks who don’t ride. When you ride a motorcycle, you are a part of the world rather than just plowing through it … the sights, the smells, the ocean, the redwoods, the sun, the rain, the perfect apex through a turn. And I love finding those gems along the way – the quaint towns or unusual sights off the beaten path that you miss when driving a car. There is an article written by Dave Karlotski called “Season of the Bike” that does a pretty good job at putting it all into words. If anyone asks me, I just tell them to look that up! Tell us about your riding. Occasionally, I will commute but not often … it’s crazy around the Bay Area during rush hour! Mostly I ride for pleasure/vacation. I also lead what we call “newbie” rides for newer riders to help them meet other riders, gain confidence and skill, and show them some of my favorite local backroads! What advice do you have for women who ride or want to ride a motorcycle? Definitely take the MSF to find out if riding is for you before investing thousands of dollars in a bike and gear. Do what is best for you and listen to your inner voice – buy whatever bike you feel most comfortable on not what someone else tells you that you should ride. Include the best gear you can into your bike budget. ATGATT!! [All The Gear All The Time] Most importantly, always, ALWAYS be true to yourself when riding. Go with your own pace and don’t get pressured into “keeping up” or doing something you’re not comfortable with. Listen to that little voice and go with what you feel is right for you. What is the longest trip that you’ve taken on your cycle? In October 2011, I did about 3500 miles on a Southwest Adventure visiting Zion National Park, Bryce Canyon, Arches, Canyonlands, Monument Valley, and the Grand Canyon. In March 2012, I did a 2700-mile trip to Baja, MX. This summer will be to Canada! Do you belong to any motorcycle groups? I participate in several online forums, am active in my local riding community with newbie rides, etc., and am also the President of Dangerous Curves, a local women’s riding group … although we do let the men come with us … as long as they behave! 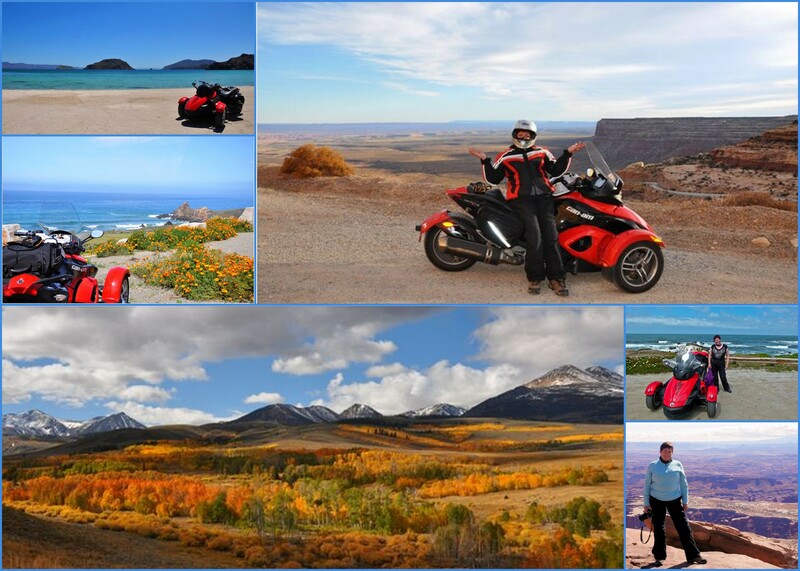 I also started a women’s touring company several years ago, NorthStar Moto Tours. I was just getting things going when my accident happened but am hoping to see if I can get things going again in 2013. Had to focus on healing myself first! Do you have a favorite riding story? Only one? Every ride has a story that goes along with it! What do you do when you’re not riding? I love photography which I combine with my moto trips. I’m the office manager for a commercial litigation firm, mom to a fabulous 20-year old daughter, and also have a musical theatre background both choreographing and performing in musicals. This entry was posted in Lady Riders and tagged ATGATT, CanAm, dirt bike, Female Motorcyclist, first motorcycle, Honda, Life lessons, motorcycle, Motorcycle Safety Foundation, riding, safety, support and encouragment, Suzuki, Triumph, women. Bookmark the permalink. Wow Tyler what a story! So glad you survived that horrible accident and then were able to get back up on that horse and ride!! Good luck with your restarting the touring company! God’s Speed and ride safe!! all I can say is WOW (too). I admire your courage to ride again, you truly do inspire others . . .
Wow, I agree with everyone else, you truly are a woman of inspiration. To have the courage and drive to heal and ride again. Just reading your story I tear up a little, and that isn’t easy for me. I hope you are able to get your touring company back on track and things are smooth sailing from here on out. You have definitely have had enough hardship, and I wish you only good things for the future..
You are such an inspiration! Your story is remarkable, glad you are still riding! I am so glad you survived to tell your tale. And glad to see you are still riding, too! What an incredibly moving story. Thanks for sharing your courage and perseverance with us, Tyler. I love you, Tyler. Seeing you in your helmet and gear never fails to make me smile. I’m so glad you kept riding. Can’t wait for Girly Ride 2012!! I feel great privilage to be a small part of Tyler’s motorcycling and life adventures. The above story only begins to scratch the surface of the many facets of Tyler. I strive to emulate her love of life. So glad you made it Lady! Tyler’s story amazing and it’s always a pleasure to be able to share in her love of motorcycling and life adventures. Truly Tyler, I’m so glad you made it! You demonstrate the grit and class of a true lady! Your story is incredibly inspirational. Thank you for sharing it with all of us. Let me know if you ever make it down to Santa Cruz for a ride through the redwoods! Thanks, Colleen… hope to get out to S. Cruz soon… the weather is really beautiful lately! Tyler is an inspiration and a fine friend. Glad you decided to remain with us rif-raf.